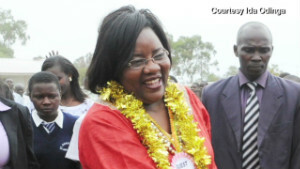 Dr. Ida Odinga, mother of grown children, successful businesswoman, champion of women rights in Africa in general and Kenya in particular and wife of the Prime Minister of Kenya, Rt. Hon. Raila Amolo Odinga was recently interviewed by CNN about her contributions in these roles and more. An intro and text of the interview follows below but a re-run of the interview itself can also be seen on CNN and KTN for next several weeks, check your local listings for actual times. We should all be happy and proud of Dr. Ida Odinga’s contributions and accomplishments in her own right which often go unheralded by our own media but one would hope they will reverse course and start covering accomplishments of ladies like Mama Ida and others rather than focusing on the latest in efforts to “stop” Raila from being reelected as president, which no doubt seems to be the in-thing for much of the media. In the larger context of things, however, Dr. Ida is just only getting started. (CNN) — It’s often proclaimed that “behind a strong man there is a strong woman” — and in the case of Kenya’s prime minister and his wife, the saying seems to be true. Ida Odinga, the wife of Kenyan leader Raila Odinga has been a champion for female rights in Kenya for more than two decades now. A teacher by profession, Odinga established a women’s voting league in 1991 and became known as the face of defiance during her country’s one-party regime. 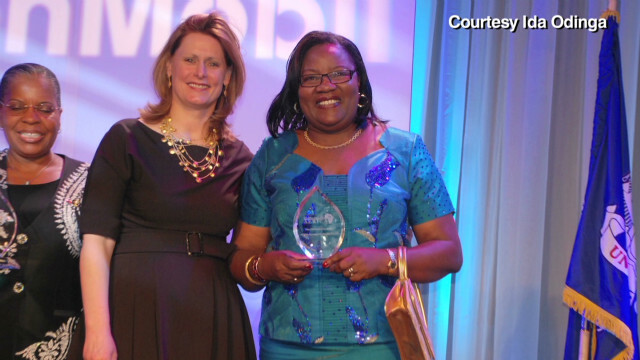 She is also one of the first women to head a major corporation in the East African nation. 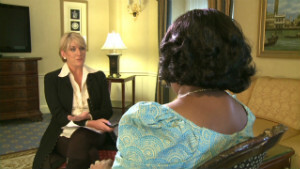 Odinga opened up to CNN’s Felicia Taylor about the role of women in Kenya and her life as the wife of the country’s prime minister. An edited version of the interview follows. CNN: What do you enjoy the most in your role as the wife of Kenya’s prime minister? Ida Odinga: Meeting with the people, particularly meeting with the young women in schools and colleges, I enjoy being with them. The most rewarding thing that I find is that when I go out in schools and in colleges, and I mentor the girls and I see how they respond to mentorship. I don’t only mentor the girls, I also mentor the girls, their parents and the community and I see the response. I find that really rewarding. CNN: What do you think is the changing role for women in Kenya now? IO: Women are taking up positions of responsibility, particularly in leadership — political leadership, administrative leadership and all sorts of leadership. And that changing role is coming as a result of education. The other thing is that there is also a really large number of young bright women who are not able to pay school fees, who are not able to advance in education. And I look for means and ways to help them so that they can at least get the education. CNN: You were one of the first women to head a major corporation in East Africa, a liquefied gas cylinder manufacturing company. That doesn’t sound like the easiest business. How did you do this? IO: The work is different because it is heavy duty work but I do enjoy it, like teaching. In teaching you start with young girls and you take them and in the end they become young women. And you see the development, in the end you see the work, the result of your work. Similarly, when you take raw materials and you cut it and you roll it and you weld it and you do this and in the end you see a beautiful cylinder standing on the other end, it is very rewarding. When you are satisfied with what you are doing and when you are in charge of what you are doing, you are powerful. And power is the nature of the game. The women must be powerful and they must remain strong. CNN: Your husband spent most of the 1980s jailed by president Moi’s government. How hard was it on you? When you are satisfied with what you are doing and when you are in charge of what you are doing, you are powerful. IO: It was very hard on me — at that time I had three children, my eldest was nine years old then I had a five-year-old and a three-year-old. Now I was still a teacher in high school and I loved my job, I did it diligently and I enjoyed doing it. But then there were challenges because for all those years, I became like a political widow without a husband and my children had to go to school, they had to leave and so forth. I was not prepared to take care of the children alone and so this thing came to me as a surprise. But then I had to mature very quickly and know how to balance my life, how to be able to do my job and still bring up the children, single-handledly for those 10 years. But there’s also something else that made it more difficult — I was always being followed by the police, they were always following me and harassing me. It was never peaceful time. And in the process sometimes I would be arrested and thrown in the cell and remained there for a weekend. CNN: You’ve said, “you must love yourself before someone else does.” What are you really trying to tell women? But don’t wait for somebody to tell you because when you wait for people to tell you, then they’ll take advantage of you because they’ll think that they’ve made you. But make them understand that you make yourself. And after you’ve made yourself, then others can come to join you to make you stronger. CNN: That doesn’t detract from being a fantastic wife, does it? You can be both. IO: It’s good to be a wife, but it’s good to be an educated wife. Being a wife, it’s just not a position of subordination — it’s a position of strength. And I’d like to show them the best way to be a wife. You’re a wife, I’m a wife of a prime minister and he loves me to death anyway. And I make him stronger by being strong.